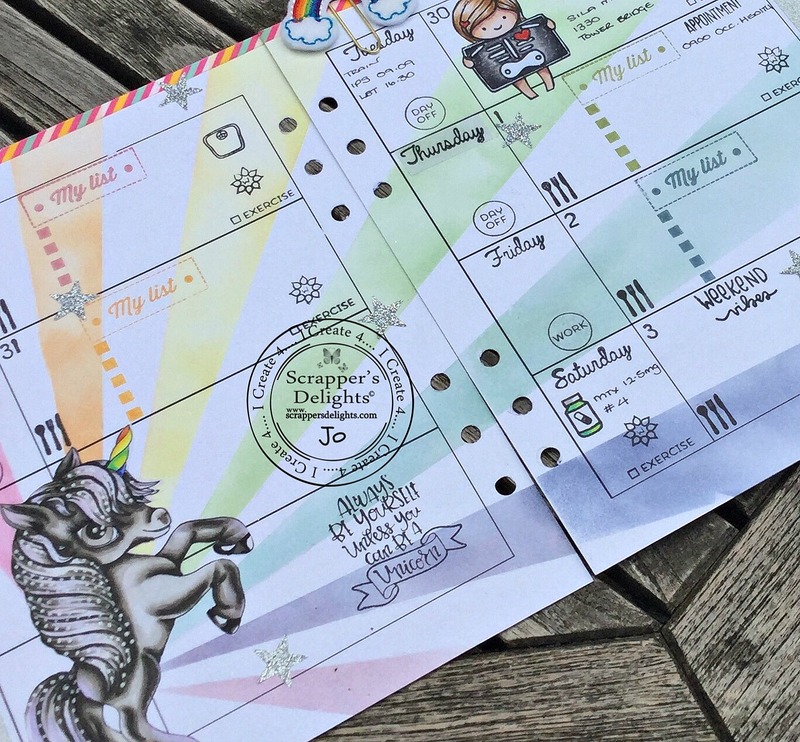 This week we have been asked to use the new 'Scrappers Delights' Horizontal Planner. However, don't panic if you do not feel you have the skills to digitally adjust things. You can always do what I do. 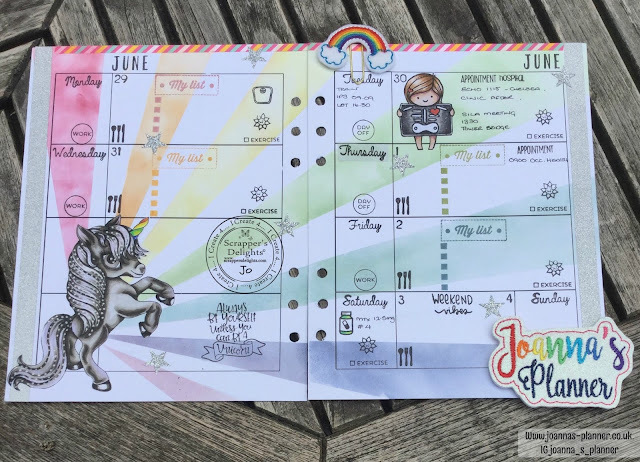 Print off the basic weekly spread and then add all the elements manually, with stamps, inks and stickers. This allows maximum creativity for crafters, memory keepers and art journalers. In this particular spread the rainbow background was created by masking off with washi tape and sponging in the rainbow colours. I have used Stampin' Up inks but most inks will work well. If in doubt try them out on a spare piece of paper before committing. 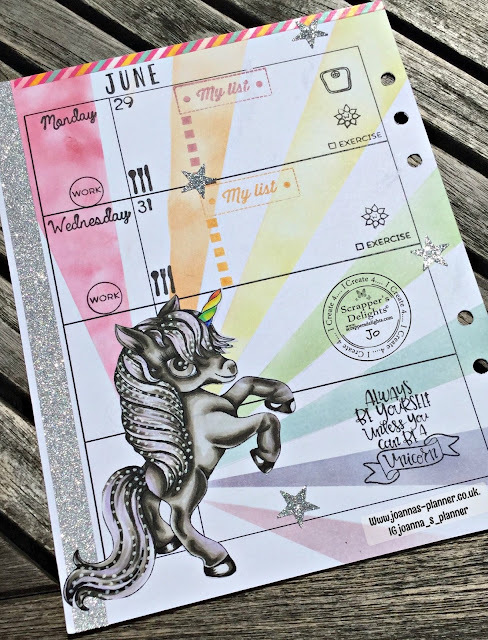 The unicorn is a digital stamp also available from Scrappers Delights. This has been printed on to sticker paper and coloured with alcohol markers before cutting out and adhering to the base layer. DO NOT use your alcohol markers direct to planner unless you are prepared for bleed through. I always worry that people will not realise I use sticker paper lol. If you are observant you will see that this planner spread has an unusual day layout. This has been done to accommodate the unicorn design which I settled in to the lower left corner. I am not sure if this was the right decision but I felt that the rainbow rays would work better from this angle. It does mean however, that I am going to have to be particularly careful that I remember which days are where. I really want two of these planners as I am not too good at planning child activities well. 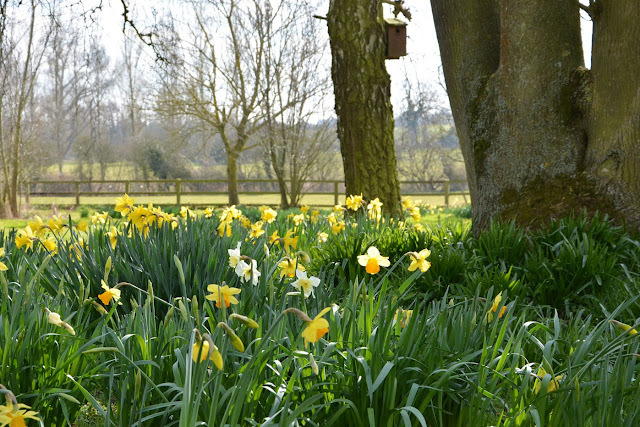 I ned them for two of my nephews as they are struggling to get their time sorted.